Those that purchase a Disney World Vacation package automatically get free MagicBands. But what if you aren’t staying on Disney property? You might be wondering whether or not you should buy Disney MagicBands to use on your trip. While not a necessity, there are reasons to buy a Disney MagicBand. When you purchase a Disney MagicBand, you get to have some of the same perks like making FastPass reservations in advance (up to 30 days before your arrival) and using it to store your PhotoPass pictures. All you have to do is link your Disney MagicBands to your park tickets through the My Disney Experience online system or app. It’s really quite simple. Disney MagicBands can be purchased online and in various stores at Disney Springs. I would suggest getting the Disney MagicBand 2.0. It gives you the added benefit of wearing it multiple ways with MagicKeepers accessories. Want to buy a personalized Disney MagicBand that features your favorite Disney character or attraction? There are plenty to choose from at ShopDisney! These are our favorites. Mike and Sulley MagicBand 2 - Monsters, Inc. 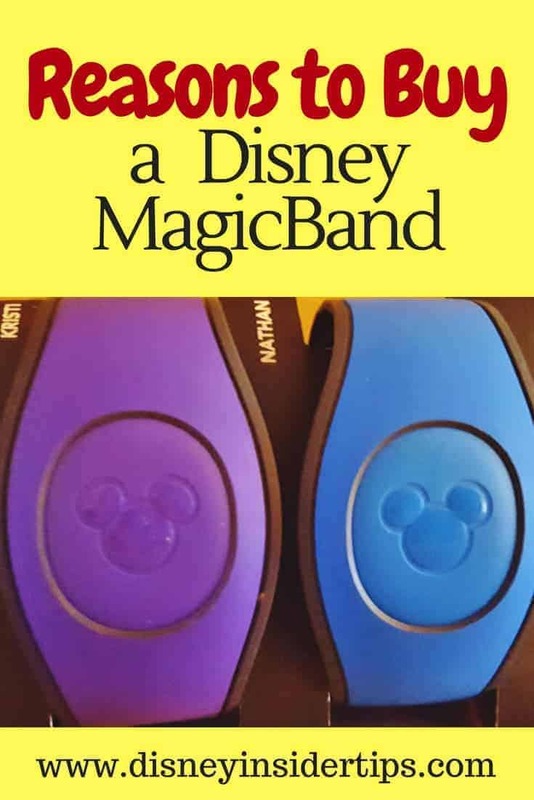 If you are not staying at a Disney Resort but want an easy way to keep up with FastPasses and PhotoPass pictures, the Disney MagicBand is the way to go. If you are going to the park for a special celebrations (like a birthday) or your favorite holiday, a specialty MagicBand is a great way to showcase a special occasion. If you want to use it as an accessory to your Disney themed outfit or show off your favorite Disney character, why not wear them on your wrist? If you want a special souvenir you can use at the Disney Parks each time you go for years to come! These bands will last you for several trips to the park, so your one time purchase will get you years of enjoyment. Would you buy Disney MagicBands? We are staying off Disney property and would like to purchase magic bands. I am wondering if I can link Disney gift cards to them to pay for food and such. No, you cannot link a gift card to MagicBands. Sure wish you could! Where exactly can I buy the magic band and how do I add the tickets to it? I plan on visiting in December. There is a link in the post above that will take you directly to the Disney MagicBands that are available to purchase online. Otherwise, you can purchase them in the resort giftshops & inside the theme park. I am planning a trip for April and we will stay off property. On our last trip we stayed at Art of Animation so we did have Magic bands. This time I will purchase them as they have become part of the fun of a Disney vacation. I’m pretty sure you don’t need them to reserve fast passes 30 days in advance though- you just do that through the MDE page- but they will scan your ban when you go through the fast pass line.. If you still have your MagicBands from your last trip, you can use those over & over. Just relink them to your tickets in your My Disney Experience account. You can also make your FastPass choices, like your said, 30 days out.